Currently (Apr. 26, 2017) there is a glitch in the ancestry database that is preventing the Family View from showing trees of certain wolves. We are working diligently to correct this problem but it will take awhile. In the mean time you can access your favorite wolf through the Pedigree View. If you go into Family View and it locks up go to the top of the page and click Pedigree View. Next click on the wolf and go to its profile for additional information. Presented here and on Ancestry.com, for your Internet access, is the heritage and genealogy of individual wolves and their packs. Find the bloodline of your favorite wolf including its origin and descendents. This project covers the time span from the reintroduction of wolves to the Yellowstone ecosystem, 1995 to present. Included are Canadian and Montana wolf parent packs with all known offspring. Photographs and biographies for individual wolves will be included. 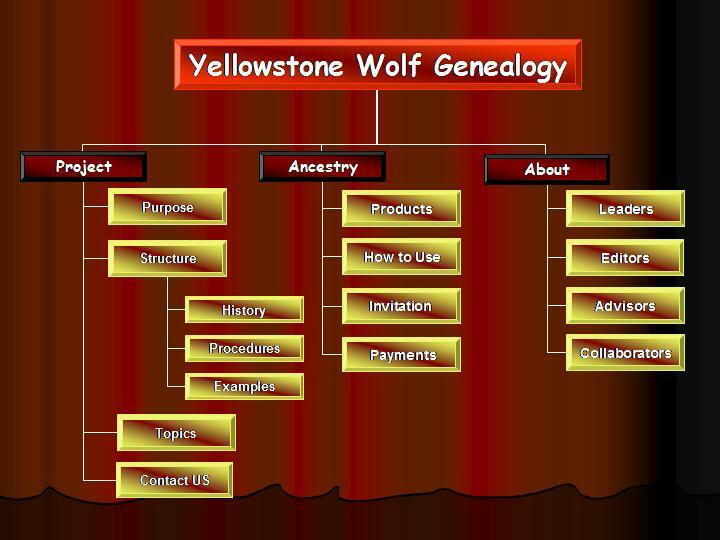 This is a genealogy tree for everyone enthralled with wolf restoration and wishing to know more about Yellowstone's wolves. It is your access to detailed information and histories. Below is a site map that will take the user to all portions of this web site. Simply click on any title. The Ancestry familiy tree is not the final record of the wolves, their lives or their heritage. The Ancestry record is only a general guideline of the history of Wolf Restoration in GYE. For any future in-depth or scientific study, researchers should consult the original records, which in Yellowstone National Park are kept by the Wolf Project. Future genetic “fingerprinting” studies may reveal or correct existing wolf and genealogy information.